TO LOVE, HONOR...AND MULTIPLY Becoming a husband and family man in the middle of a raging land feud wasn't the destiny Galen Callahan saw for himself. But once he laid eyes on Rose Carstairs, he knew the bouncy blonde with the warrior heart was his future. Now, with Rancho Diablo under siege, the eldest Callahan sibling will do whatever it takes to protect his new wife and triplets. Except Rose refuses to be protected No husband of hers can stop her from fighting by his side while keeping their newborn sons out of the line of fire. With Callahan lives and legacy on the line, Galen has a new mission: to vanquish a dangerous enemy and bring his family together in time for Christmas. USA Today bestselling and award-winning author Tina Leonard writes with humor, sexiness, and fun. With nearly 2.6 million books sold, she plans to keep writing books readers enjoy. Her writing schedule keeps her very busy with independent heroines and the heroes who love them. 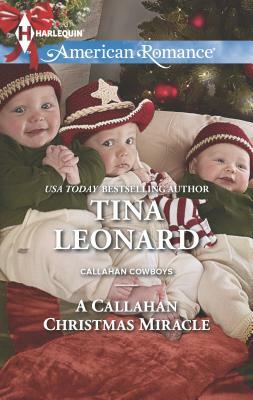 You can visit Tina at www.tinaleonard.com, or www.facebook.com/tinaleonardbooks.